When I purchased my home in 2010, it had been empty for two years and was a bit neglected shall we say? I saw so much potential in this run-down, brick ranch and had grown tired of life as a renter. As a single parent, my pockets were certainly not deep by any stretch of the imagination, but I dreamed of feathering my new nest quickly. Re-using materials and seeking out salvaged material was a necessity rather than a personal “green” statement. At the time, I did not know about the fabulous resources available nearby. So, like many, I started out sanding and refinishing cupboards in the kitchen, visiting “big chain” home supplies stores when I scraped up a few dollars, and graciously accepting leftover drywall and flooring from friends in the midst of their own remodeling. Here are a few shots of one project in my home, where I used salvaged drywall, leftover white paint and once-loved flooring (in front of the fireplace). You can see the shadow of previously displayed art above the fireplace mantel. Smoke damaged walls and fine seating…gotta love it! Hand-me-down furniture, paint, and salvaged drywall never felt so good! Although I will be eternally grateful for the cast-offs of friends and neighbors, I needed a more consistent resource. That’s when a friend at work referred me to a few other valuable suppliers in the area. I’ve mentioned The ReStore in a previous post, but another little peach is The StockPile. This piece (GRAB) by Hammer & Hand is composed of salvaged metal grain bins attached to a plank of reclaimed barn wood. Click the image to learn more about these building contractors in Portland & their mindful mission! Do you love watching HGTV’s Rehab Addict like I do? Then you have to take time to stumble into Habitat for Humanity’s ReStore in Stark County. Find building supplies, once-loved fixtures, and gently used furniture and start re-imagining! If you are looking for a “new-to-you” desk for your home office or craft room, this is the place! Tile for a back splash? Check! A darling, retro light fixture? Check! 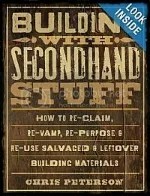 Their site has great links to DIY projects, green living, and up-cycling ideas too. The ReStore takes donations and has volunteer opportunities as well. Habitat for Humanity has helped build and rehabilitate over 400,000 houses, serving over two million people worldwide. They were founded in 1976 as a non-profit Christian ministry to assist low income folks in their dream of home ownership. I am tickled pink that they have created ReStore as a great resource for those of us with tiny bank accounts, but big dreams too. Stop in, bring those ideas to fruition and re-imagine handmade!